TAG has developed a new online facility management program designed to aid facility managers in keeping an accurate record of finishes throughout their facility. Day to day maintenance issues such as replacing cracked tiles or painting over scratched walls can often be made more difficult by not knowing what product should be used in repairs. The software provides an easy reference acting as an interactive finish schedule with an intuitive graphic interface that leads the facility manager to the exact product needed. The software’s interface features a graphic representation of the buildings floor plans where the user can zoom and pan to select the area in question. Once selected, the software reveals a collection of swatches for all of the finishes used in the area organized by category. The user can then click on the specific swatch to display information on the selected finish including an enlarged swatch of the material, manufacture and product number and a link to the manufacturer’s website. The program also features a secure administrative area where records can be updated to reflect any changes in finishes that occur. 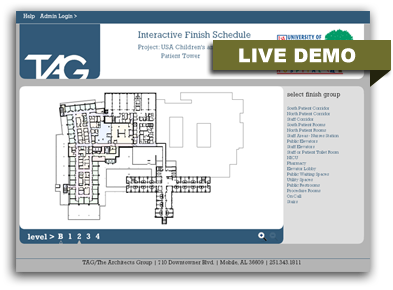 TAG’s new online facility management software extends TAG’s customer service well past the design and construction phases of your project. Click here to try out a live demo .